Feeling cool is awesome (feeling awesome is also cool)! It’s usually because you did something you couldn’t before and trumped the “old you”. Sense of accomplishment though relies on knowledge of your past self. Without the right info to measure against, you’ll never know just how honestly terrible you used to be! So we’ve cultivated some features that are going to help nurture this feeling of self-satisfaction and give you the info you’ll need to make decent strategic decisions about the production of soup. Earnings Report – Check your shipment history over time with a breakdown of soup flavours per shipment included. Hello! I am drunk robotic artist Yamatron! We added a gallery page this week! ! You can see early concepts, the magazine “Astronote” in the galaxy of Inc., comics and more and more. Morning! Samurai Programmer Sawa (and cub) here! Is everyone finding the dev blog useful!? Chat with us in the comments whenever you like~! Ok, so have you ever seen the credits of a PixelJunk game? Anyone that hasn’t, get straight over to the PSN Store, buy all the PixelJunk games and clear them! Did you notice a name that appears every time in our credits? Yep that’s right, it’s our CEO Dylan Cuthbert… ..wait no, i’m talking about Game Monkey!! 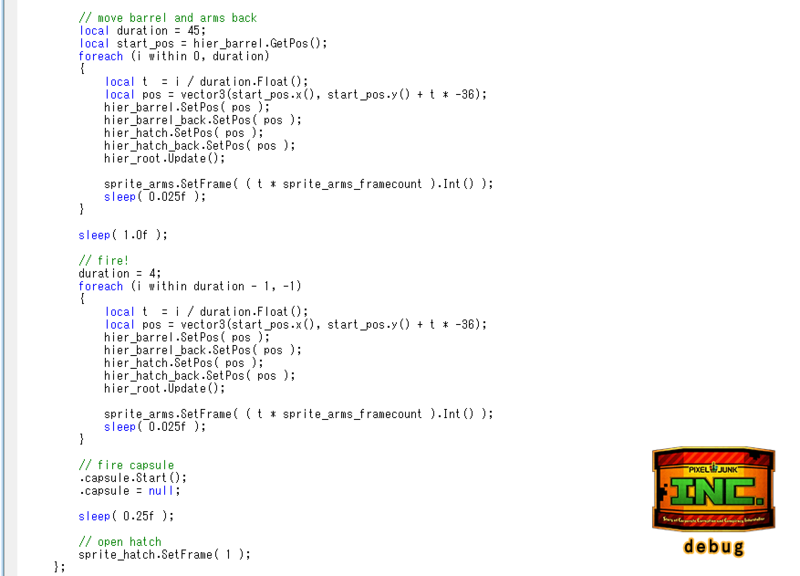 It might feel weird, but over 70% of PixelJunk games are made in script. 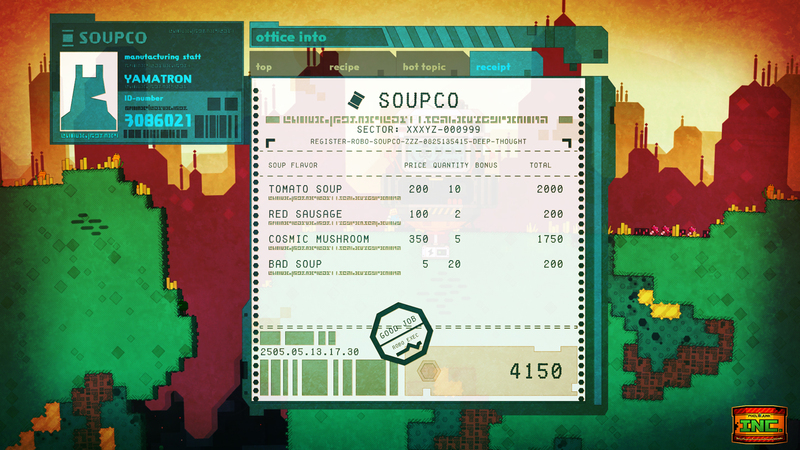 PixelJunk Inc. is of course no exception. The name of that scripting language is Game Monkey, our dearly beloved, stylin’ monkey friend. And with that, here’s this week’s “imagination shot”! As you can see, there’s lots of ‘sleeps’. If you want to put a brief delay between this thing and that thing a ‘sleep’ can help you out. Although, if you’re not careful the code can get overrun with them. It’s still better than the alternative though, of implementing ‘sleeps’ in C++, then having any small tweak trigger an entire C++ build each time… that’s a big waste of time we’ve avoided. GameMonkey lets you easily make threads (typically called fibers or coroutines) making it super convenient! Oh!.. My cub and monkey are calling.. I’ll leave it here for today. Hello! I was working on a menu around with Sawa this week. Looks like still much to be done. Today’s topic is the story of robot GIFs attached to the end of the blog post every time. I make a robot that was imagined from the contents of the article by noon every Friday. Motto is, as much as possible, laugh! 2. photoshop make animation& export to GIF. That’s it. I tried to also capture part of illustrator work this time, see if you like. Theme is “Rocket bot!” GOGOGO! There was already a few buildings that provided easy vertical motion, but none that were really doing anything horizontal to let you chain-automate production.. There’s a bit going on in this screenshot so I’ll break it down. The skill tester building on the left pulls up whatever falls into its claw. The tube is a higher tier infrastructure building that we showed before, transporting things from A to B. That’s a funnel on top of the tube’s entry, which automatically funnels things into whatever building it’s attached to (art is still placeholder). You can attach funnels to a soup factory, deconstructor, furnace, or whatever else you feel like. 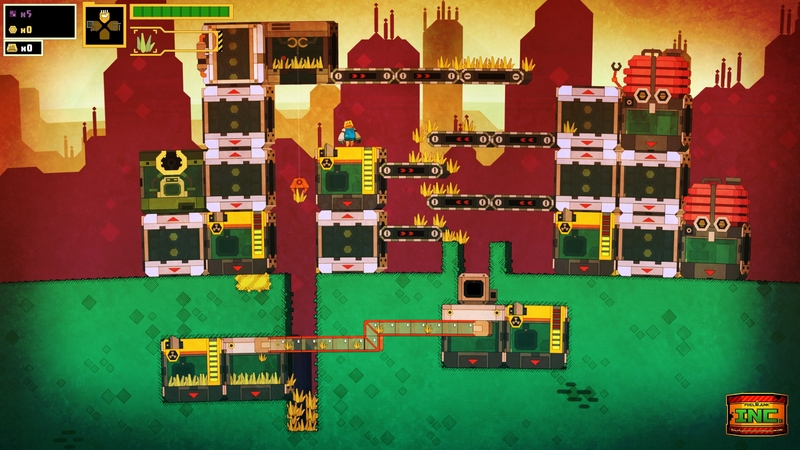 We also confirmed this week that PixelJunk Inc will be coming to PAX Prime! :) More details to follow.